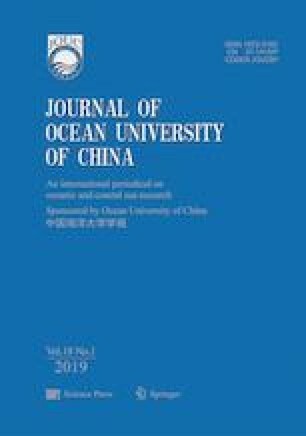 A coupled approach based on grain size and geochemical elements is used to trace the provenance of surface sediments and to confirm the distribution patterns of grain size and elements on the continental shelf off western Guangdong Province and northeastern Hainan Island. The mean grain size ranges from 0.05 φ to 7.28 φ with a mean value of 5.60 φ. The average concentrations of major elements descend in the order of SiO2 > Al2O3 > CaO > Fe2O3 > K2O > MgO > Na2O > TiO2 > P2O5 > MnO, while those of trace elements exhibit a descending order of Sr > Rb > Zn > V > Cr > Pb > Ni > Cu > As > Cd. On the basis of the distribution patterns of elements and results of statistical analysis, the study area is classified into three zones. Zone I locates on the continental shelf off western Guangdong Province, and the sediments are mainly from Pearl River, Taiwanese rivers, and small rivers nearby. Zone II locates in the eastern exit of Qiongzhou Strait and the coastal area off Leizhou Peninsula, and the sediments are mainly from the erosion products of Qiongzhou Strait and Hainan Island. Zone III locates off the eastern Hainan Island and the continental shelf deeper than −50 m isobaths, and the sediments are mainly from Hainan Island and coral reef. The influence from open water should also be considered. Results indicate that the grain size is the main controlling factor for major and trace element contents and that anthropogenic impact and biological activity also play an important role in the distribution of these elements. This work was supported by the National Natural Science Foundation of China (Nos. 41476047, 41106045, 41506064 and 41427803), and the National Programme on Global Change and Air-Sea Interaction (Nos. GASIGEOGE- 03 and GASI-04-01-02). We would also like to acknowledge Nanjing University and the Institute of Geophysical and Geochemical Exploration, Chinese Academy of Geological Sciences, China, for the technical assistance in laboratory analysis.